Can a 12-year-old, 260 square foot kitchen be completely gutted and transformed in only eight weeks? With Dreambuilder managing the project, you bet it can! The McDonald family built their home on the Intracoastal Waterway with a national production builder. While please with the home overall, a lingering disappointment was the design of the kitchen which had three distinct problems. Though somewhat open to the family room via a bar/pass-through, one had to walk out of the family room, into a hall, and then into the kitchen in order to move between rooms. 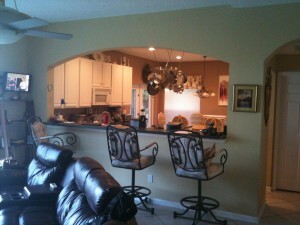 The breakfast room was on the opposite side of the kitchen from the family room. This made for a very closed-off feeling in the kitchen and limited the McDonald’s ability to entertain. Second, the kitchen was crowded due to an island that was really too big for the space, and the location of appliances throughout the kitchen meant constant navigation around the room. The pantry, tucked in the far corner, was a full 17 feet away from the range and sink areas. Worst of all, the poor design resulted in kitchen cabinets covering most of the rear wall of the kitchen – a wall completely blocking the McDonalds’ beautiful views of the intracoastal. 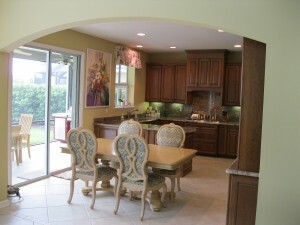 The plan effectively swapped the locations of the breakfast room and kitchen, placing the breakfast room in the middle of the family room and kitchen. This allowed us to open up the wall between the family room and the new breakfast area, creating one large room for entertaining. The new kitchen is a chef’s dream. All wood, full-overlay cherry cabinetry with a special glazed finish conceals several features such as soft-close drawers with dovetail construction, special drawers for trash cans, pots and pans, and spices, and fully-accessible corner cabinets. And, due to the new kitchen design, all appliances and the pantry are within just a few feet of each other. The focal point of the room is the custom-built buffet with floor-to-ceiling towers and an additional sink. Glass doors and appliance garages make the piece beautiful and functional. Exotic granite and a full granite backsplash bring additional luxury to the room. Beautiful coordinating finishes, from plumbing fixtures to cabinet hardware to paint to floor tile, help bring the kitchen into current style. GE Monogram appliances, including a double convection oven, built-in microwave and gas cook top (for which a special gas line was installed), allow the McDonalds to entertain with ease. You can see before and after pictures of Dreambuilder Thirteen in our Dream Home Gallery, and complete progress pictures from start to finish are on our Facebook page. You can also read the Mrs. McDonald’s complete testimonial. 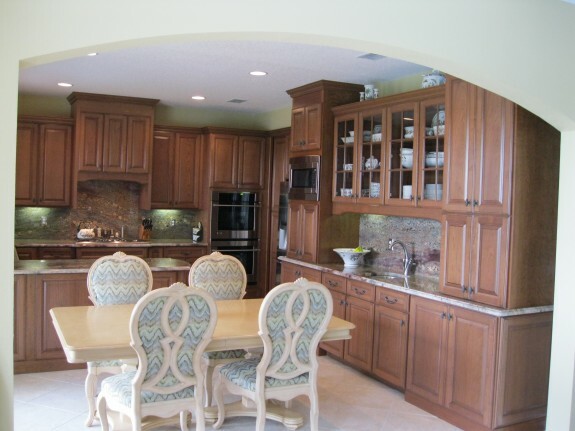 Dreambuilder Custom Homes can help you with any of your renovation, remodeling or addition project. Contact us today for a complimentary consultation!